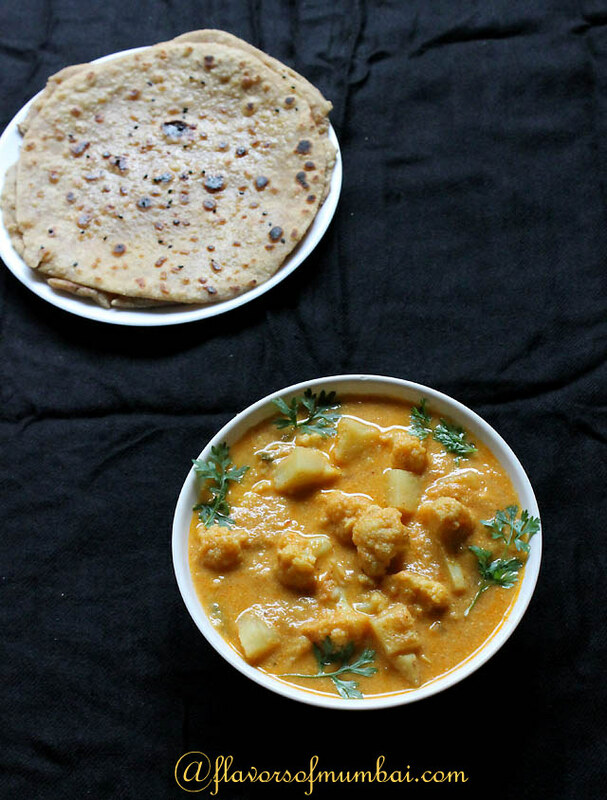 Easy and simple to make Aloo Gobi Curry! Aloo Gobi is one of famous dish from Northern India. This is my version of Aloo Gobi Curry. I like my curry to be creamy hence added some melon paste. This dish can go as a side meal, morning breakfast, lunch, brunch when clubbed with roti, chapati, puris Or rice. Have tried punjabi aloo gobi earlier which also tasted good. Cauliflower is called as phool gobi in India. 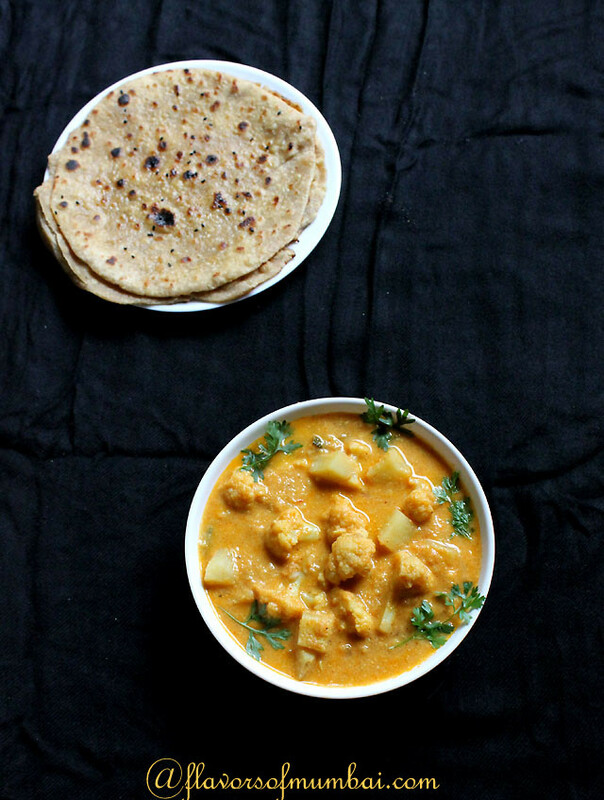 My hubby loves cauliflower hence will explore more and come up with more recipes. I have made whole wheat parathas, rice, crispy bhindi along with this curry. Facts about Cauliflower– Cauliflower fights cancer, has vitamin C, vitamin K, also has beta-carotene. It’s great for detoxification and aids digestion process. Also had good minerals such as manganese, copper, iron and calcium. So do include them in your diet. How to select Cauliflower? Cauliflower is easily available throughout the year. Go for fresh cauliflower which is white and has intact greens around it. Avoid picking cauliflower which has light patches Or brown head over them. How to store Cauliflower? They stay for a week or more if stored correctly. I wrap the cauliflower with a brown paper, butter paper Or foil. Then store them into the fridge. This way it lasts for more than a week. This vegetable has to be washed under tap water. Later chop into florets . Also you could use it’s leaves. I utilize it’s leaves as well because my mom does so I also follow her. Now take warm water with salt into a vessel. Immerse the florets and leaves into this water for 10-12 mins. Now strain the water and cauliflower is ready to use. 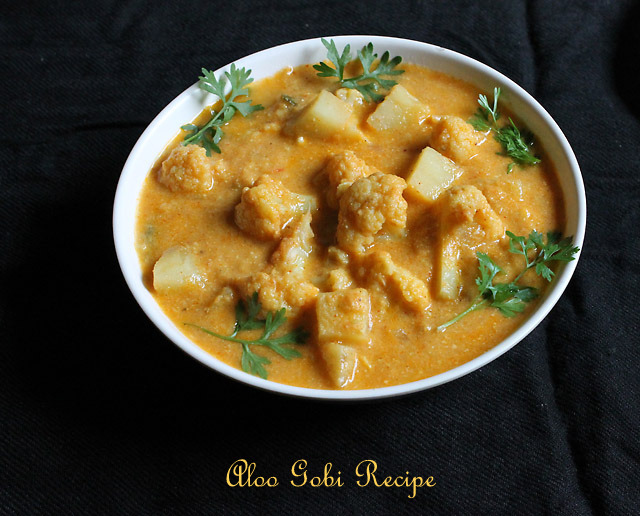 Aloo Gobi is famous recipe in India made from cauliflower. It can also be clubbed in lentils, gravies, pastas, mashed cauliflower, soups etc. I wasn’t in a mood to make lentils so made gravy from gobi. Grind the onion until smooth puree is formed. Also grind the red tomatoes, ginger and garlic until they blend well. Same manner grind all the ingredients for white paste. Add little water if required. Peel potato chop them into small cubes. Immerse them in water. Take a pan add oil + butter. Add cumin seed. Once they crackle add chopped onion. Also add the ground onion paste. Saute until onions turn light brown in color. Now time to add tomato red paste. Add all the powdered spices except salt. Cook until oil separates from the gravy. Now add green chilies, cauliflower and potatoes. Cover with a lid add some water over it. Cook until potatoes are tender. Add black salt for seasoning. Add the melon white paste. Cook for 2 to 3 mins more. Check the consistency. If you feel the curry is too thick then add little water. Finally taste and alter any spices if required. Garnish with coriander leaves. Serve hot with a dollop of butter along with rotis Or puris. Always wash cauliflower under tap water. Chop them into florets along with leaves. Immerse them in warm water plus salt.This way if there are any worms Or dust particles they will come out. Also immerse chopped potatoes in water else they will start darkening. I didn't add any water to this curry. But if you like a thinner consistency then add water. Instead of melon seed you could use almonds Or cream Or curd. Do we grind onion and tomatoes together? If not, then do we add the onion paste before adding the tomato paste? Grind them separately and I have skipped one step. Add the onion paste after adding chopped onion. Saute till they light brown then add tomato paste. Thanks for highlighting. Aaloo Gobi at my house is very common and good to know one more variety of the same ingredients..delicious curry. Surely try Rumana 🙂 and lemme know.